The League of Maritime Editors weekend raised daring allegations of wrong doings, massive corruption in the port system against the Comptroller General of the Nigeria Customs Service (NCS), Rtd Col. Hammed Ali, officers of the Strike Force (SF) created by his office and others at the nation’s ports and border stations. In the case of the CG, the League, which comprises seasoned journalists who have contributed to the development of the maritime sector and the economy accused Ali of compromising President Muhammadu Buhari’s anti-corruption crusade following series of activities that have been taking place in the Service. In a Quarterly State of the Nation’s Review on the activities at the ports, the Editors said Ali had failed as far as reform is concerned in the Customs Service. The Editors said the system in the ports has remained worsening corrupt practices in which importers are extorted to the marrow by members of the Strike Force and Federal Operations unit (FOU) in another round of malpractices when the former had been cleared and authorised to take delivery of their goods. The League described the high revenue generation by the Service as simply a ruse since there has been a drastic fall in inward cargo throughput coupled with the depreciation in the value of the Naira. Part of the state reads: “For over three and half years as Customs CG, sitting on several billions of naira as annual budget, Col. Ali has awarded contracts in contravention of the due process and in the absence of a constituted customs board and does not ever report to the Minister of Finance, who should be the supervisory minister. He singlehandedly awards contracts with President Buhari’s approval sometimes, as claimed. No Customs contract has ever been openly tendered for since Col. Ali assumed office, findings have shown. Can the CG provide details of the beneficiaries of the contracts? “Findings have also revealed that the CG in a most corrupt fashion has usurped the powers of the Customs board in the conduct of examination and promotion of senior officers of NCS such that he singlehandedly promotes officers at his whims, thereby raising the question of how transparent he could be. It is the statutory duty of the customs board to conduct promotion test and ratify the promotion of senior officers-from one star, Assistant Superintendent of Customs (ASC) to the Comptroller cadre., while the customs management is empowered to only promote people from Customs Assistant cadre to the Inspector cadre. But the CG approves all promotion since assumption of office. “The League of Maritime Editors wonder if the CG does not rather encourage corruption among officers and men of customs service when officers on transfer to other stations are denied transfer benefits such as transport fare and accommodations when the law provides 28 days accommodation payment pending when he or she gets accommodation. Also, against the law, officers are invited to sit for promotion exams without transport fares, accommodation and feeding allowance. 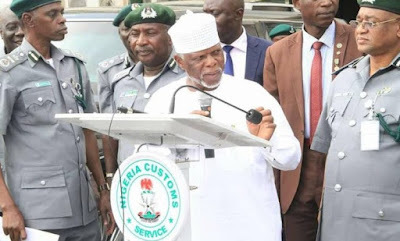 “Investigations show that goods on which import duties have been paid are intercepted on the roads by the officers of the Federal Operations Unit(FOU) and the CG’s Strike Force headed by his Principal Staff Officer(PSO). The only exemption is when the importer or his agent “settles” the officers. “The CG’s Strike Force collects N100,000 per 40 feet container to cover for under-declaration, concealment while contraband containers pay as much as N1million before being allowed to exit both Lagos and Eastern ports. 20 feet containers pay N600,000. The PSO allegedly singlehandedly nominated members of the Strike Force and insists that the coordinator reports to him. “The FOUs, it was gathered, have organized syndicates made up of clearing agents who collect money illegally on their behalf to avoid interception of containers. In Lagos, a leader of a leading freight forwarding group based in Lagos represents the FOU Zone ‘A’. Importers and agents drop between N100,000 and N150,000 with the syndicates for the FOUs. “Also, the seeming high revenue generation by the service has been a ruse as there has been a drastic fall in inward cargo throughput coupled with the depreciation in the value of the Naira, presupposing that N1.01trillion generated in 2017 fiscal year and previous years’ figures loomed large because of the exchange rate difference and policy distortion. “Although the vision of the CG through the task force is to stop the extortion of money, the outfit has compromised its objective as the CG relishes the distortion premised on huge returns to both personal and government coffers. “On valuation, the service has also compromised itself as officers collect certain amount of money from importers, a development which promotes underpayment by importers and their freight forwarders, hence the seizure of most released goods from the ports. This creates rooms for extortions by both the FOU and the ‘Strike Force”. “Our findings have also shown that the Benchmark policy on imported vehicles is rooted in corruption as customs officers toy with the intelligence of importers and their agents even as there is systemic corruption arising from wrong classification of import duty rates. “Observing that the NCS is supposed to be facilitating trade as enunciated in the World Customs Organization(WCO) policy for customs administration globally, the League noted that the NCS has failed to deliver this value at the seaports with its adverse effect on Ease of Doing Business policy of the Federal Government. “It is on record as recently corroborated by the Managing Director of Nigerian Ports Authority(NPA), Ms. Hadiza Bala Usman that the NCS has refused to comply with the Ease of Doing Business policy in cargo delivery process. “According to the League of Maritime Editors, investigations have equally shown that Customs authorities still allow prohibited export items such as thick wood and scrap metals for export in Apapa,Tin Can and Onne ports. “Findings have also revealed that despite the Federal Government’s claims that it has stopped importation of foreign rice in to the country, foreign rice still flood the local markets because rice are now mainly being imported through containers via seaports, no longer land borders. They are declared as fishing nets, mosquito nets and building materials in collusion with the Strike Force and FOUs and are cleared unhindered at the seaports. “Have Nigerians asked why there seem to an increase in importation of arms into the country in recent times? All sensitive positions in customs currently are manned by a section of the country, thereby raising the fear of gross incompetence or compromise at seaports, land borders and FOUs. “It was gathered that the issue of closure of warehouses in the Lagos industrial areas of Ilupeju, Ijora, Amuwo-Odofin, Iganmu, among others, that drew the attention of Alhaji Ahmed Tinubu, the National Leader of the All Progressives Congress(APC), who called on the attention of President Buhari was also as a result of the extortionist tendencies of the Customs officers." Reacting to the allegation on extortion of importers, the Public Relations Officer of the Service, Deputy Comptroller of Customs, Mr Joseph Attah said the allegation raised by the League was a compound one. Attah said what the Service wants was a specific case or evidence of wrong doing by any officer to be able to take action. But he added that the Service would carry out investigation based on the allegations raised and bring erring officers to book. On the allegation of the CG usurping the powers of the Board of Customs and single-handedly awarding contracts, the image maker said this was not true. According to him, the CG only sought the approvals of the President on specific jobs when there was no Board, adding that this was no longer so. He claimed that with the presence of the Board, the CG has stopped going direct to the President. The Public Relations Officer of the Federal Operations Unit (FOU) Ikeja, Mr Jerry Attah who reacted to the allegation of corruption against officers claimed this was a fallacy. Attah also claimed that this was mainly to dent the image of the Unit since it had no room for compromise. Attah insisted that the Unit would continue in its anti-corruption war, adding that no amount of distraction will stop the Unit. He however challenged anybody with specific case involving officers on corrupt allegation to make it available to the management.